Ras al Khaimah is the northnermost emirate of the UAE and borders to the Omani exclave of Musandam. The Ras al Khaimah emirate has been settled for thousands of years and joined the U.A.E. in 1972. It is surrounded by the Hajar mountains and offers a diverse scenery, ranging from sandy beaches, to desert oases and mountains. The city itself is unremarkable and poorly planned (access to the Corniche road is for instance difficult). 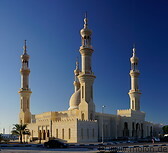 One of the highlights of Ras al Khaimah is the Sheikh Zayed mosque. Ras al Khaimah has several good hotels, located around the creek and north of the historic core (international level resorts with an own beach).